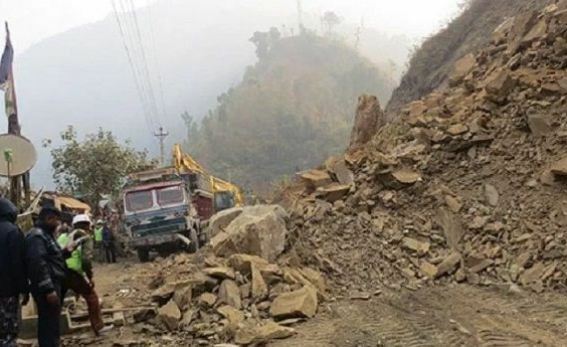 Rasuwa –Vehicular movement along the Pasang Lhamu road has been obstructed due to landslide today. The landslide occurred at Gosainkunda Rural Municiplity-5 blocked the road completely. According to Division Road Office Chief Niraj Shakya, it takes time to resume the traffic where hundreds of vehicles are now stranded along the road section. The rural municipality chair Kaisang Nurpu Tamang said they were initiating to resume the transport as soon as possible. It is stated that thousands of tourists and travelers from home and abroad (particularly, Chinese and Indian) are facing difficulties due to road blockage.